What happens to a lawn during drought? Without sufficient water, the ground may become rock hard and cracks may start to appear. The grass coverage will be poor and may appear to stop growing at all. Your lovely green grass may turn yellow and even retract from the lawn edges. What is the long-term effect on a lawn? Grass is a hardy plant. In most cases, your lawn will not suffer any long-term damage from a season of drought. Once the rain returns, you will quickly see the grass returning to a healthy green colour. How can I reduce the effects of a drought? A healthy lawn will better tolerate dry conditions. Don't wait for the drought to arrive - scarify and aerate your lawn to reduce compaction and encourage healthy growth. Good lawn keeping practices should be upheld all-year-round. The lawnmowing mantra is "mow little and often". Mow your lawn too short and you could be in danger of scalping. Scalping is a common mistake made especially by owners of rotary lawnmowers. Avoid pressing down on the handle of your lawnmower when in operation and raise the cutting height of the mower blades. The rule of thumb is to only mow 1/3rd of the grass height at a time. Consider leaving the grass a little longer during dryer periods. Tall grass offers shade to the plant roots and reduces moisture evaporation. A lawn cut too short will quickly dry out. Only mow your lawn early in the morning or late evening. The air temperature will be lower and, with dew on the grass, less damage will be caused to the grass plant. Vary your lawnmower mowing pattern. Changing the direction that you mow will reduce the impact of your mower's tyres. This could prevent wearing out channels into the parched ground. Mulching is a real alternative to cutting with collection or 'bagging' clippings. A mulching lawnmower will cut the grass, circulating the clippings within the cutting chamber. The clippings are reduced to a fine mulch which is then thrown back to the lawn surface. This mulch quickly decomposes within a few days. Mulching lawnmowers can help during times of drought. The mulched clippings provide additional shade and help to reduce evaporation. The moisture contained within the mulch (around 80% of the grass clippings is made up of water) will be returned to the lawn. In one part of this article, it is recommended that the lawn is scarified and aerated, but this seems to go against the next recommendation which is to use a mulching mower leaving the grass under the finished lawn. Can you explain please. A great question... I assume that you are referring to the accumulation of thatch that can build up from leaving clippings on a lawn? 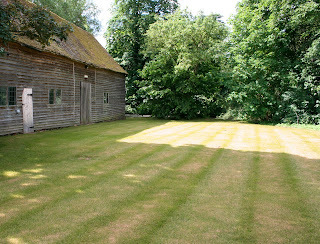 If using a good quality lawnmower that has been designed to 'mulch', the mulched clippings will not be creating thatch. As long as you have your cutting height set correctly, the clippings should be very small and will quickly decompose. Problems arise when long grass is left on the surface of the lawn. This can create a matted layer of thatch and encourage moss growth. what is wrong with a moss lawn.